The Bay Area’s favorite palate-pleasing experience is back! Join KQED and Leslie Sbrocco for this year’s Check, Please! Taste & Sip. 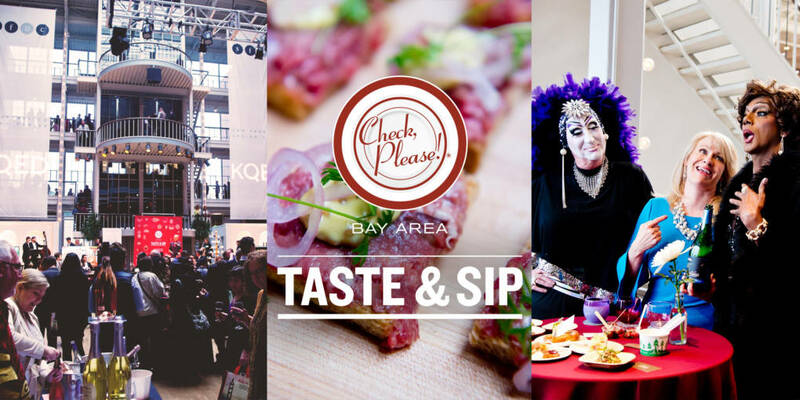 Sample gourmet food from restaurants featured on the show and taste wines around the Bay Area – more than 50 local culinary creators all under one roof! VIP Experience with early entry from 5:45pm-6:30pm will feature special bites from a select group of restaurants, artisanal caviar, and sips from some of our favorite winemakers. All food and beverages included in the ticket price. Must be 21 years or older to attend. Use the code EARLYBIRD for 15% off (main event tickets only). Sample Wines: Alara Cellars, Berryessa Gap Vineyards, Camlow Cellars, Charles Krug Winery, Eberle Winery, Furthermore Wines, Gratus Vineyards, J. Lohr, Jason-Stephens Winery, Long Meadow Ranch, New Zealand Winegrowers, Notre Vue Estate, Ponzi Vineyards, Smith-Madrone Vineyards & Winery, Steele Wines, The Larsen Projekt, and more! Special thanks to our wonderful Check, Please! Bay Area Season 14 sponsors: Integrated Resources Group, Oakland International Airport, Oceania Cruises, Redwood Credit Union, Sutter CPMC, Total Wine & More. Thanks also to our Taste & Sip event partner Tsar Nicoulai Caviar and Brava. Additional thanks to Abbey Party Rents SF, McCalls, San Francisco Design Center, KQED Volunteers.